Formerly known as Taipei International Invention Show & Technomart, the Taiwan Innotech Expo entered its 14th year in 2018. This year, the exhibition displayed and featured a total of 1300 different technologies from 496 exhibitors. A total of 45,000 professionals and casual visitors from around the world had attended this event, which took place from September 27th to September 29th in Taipei. Up to 74 international organizations from 33 countries/regions, including the US, mainland China, Vietnam, Japan, Hong Kong, Canada, Germany, Thailand, Korea, and Singapore, had been invited. During the course of the expo, more than 1000 cooperation and partnership opportunities had been discussed. This year, the exhibition featured three thematic pavilions, including "Future Technology," "Sustainability," and "Innovative Invention." 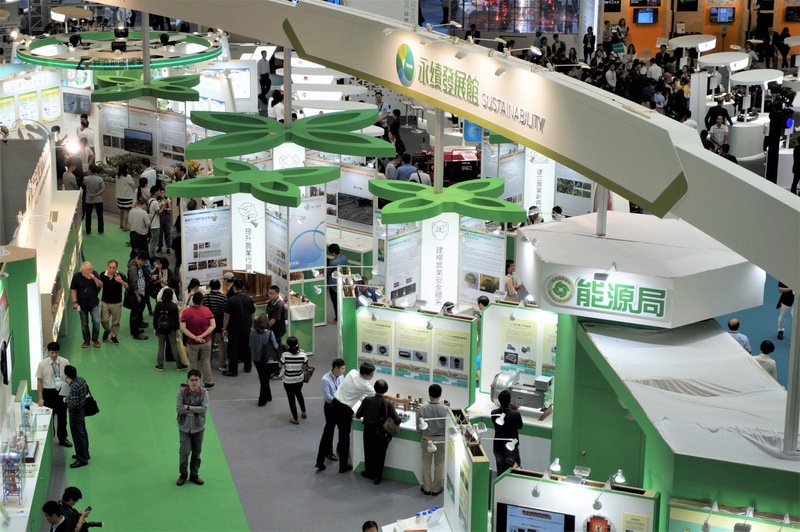 The "Sustainability" pavilion demonstrated the latest technologies developed by the Council of Agriculture (Executive Yuan), Bureau of Energy (MOEA), Atomic Energy Council, and State Enterprise Commission (MOEA), highlighting sustainable farming techniques and green energy technologies that improve the quality of life and reduce environmental impacts. To facilitate technology exchange between Taiwan and the rest of the world, this exhibition has also invited international exhibitors. The aim of the Taiwan Innotech Expo is to accelerate the implementation of sustainable development. In the wake of environmental problems caused by the pursuit of economic growth worldwide, the WCED (World Commission on Environment and Development) released "Our Common Future in 1987", which defined sustainable development as seeking to meet the needs and aspirations of the present without compromising the ability to meet those of the future. The extreme weather events and increasingly frequent natural disasters in recent years prove the urgent need to implement sustainable development. Natural disasters have become more frequent nowadays as evidenced by the heat wave in Europe which hit 48 degrees Celsius, the wildfires in California, the deadly typhoon in Kansai, and the powerful earthquake in Hokkaido. All of them happened after July 2018. This year at the Taiwan Innotech Expo, local organizations including the Council of Agriculture of the Executive Yuan, the Bureau of Energy of MOEA, the Atomic Energy Council, and the State-owned Enterprise Commission of MOEA presented their sustainable farming techniques and green energy technologies at the "Sustainability" pavilion. Designed to solve the environmental problems in Taiwan, these technologies fully demonstrate these organizations' technological capabilities. As the competent authority on the agricultural, forestry, fishery, animal husbandry, and food affairs in Taiwan, the Council of Agriculture has strived to promote high-tech farming to enhance Taiwanese farmers' competitiveness. Eying on the great energy potential of biomass from agricultural by-products (Agro-Waste) which not only minimizes the impact on soil, water, and air quality but also contributes to a circular economy, the Council of Agriculture has developed technology for efficient utilization of agricultural wastes. Considering the nature of Taiwan's agricultural environment, the Council of Agriculture has combined the application of composted waste to agricultural land, reuse of biogas, and smart and automatic environmental control in one system to improve the production process of biochemicals, materials, and fertilizer, thereby maximizing the use of agricultural wastes. Other key technologies presented by the Council of Agriculture include agrivoltaic systems and mass production of blue-striped angelfish. Agrivoltaic systems combine crop production with green energy generation with the former as the top priority. Crops and cultivation technologies are carefully selected to ensure coexistence of solar panels and crops and hence a balance between agricultural production and energy strategies. The technology for mass production of blue-striped angelfish involves establishing a systematic process for growing blue-striped angelfish such as inspection of brood fish, transition from endogenous to exogenous feeding, and matching. The Bureau of Energy has spared no effort on developing and promoting new energy, renewable energy, and energy efficient technologies. At the expo, the Bureau of Energy demonstrated its BESTAI platform which provides energy efficiency strategies and analysis of return on investment. It also integrates GIS to analyze energy consumption of buildings in different areas. With this platform, people without professional skills can easily diagnose the energy consumption of commercial and residential buildings, saving a lot time and costs. The ultrafast rechargeable aluminum battery developed by the bureau is the world's first rechargeable aluminum-Ion battery. The graphite for conductivity in the battery is as flexible as paper and boasts low manufacturing costs, high safety, and high energy density. The fluid-driven emergency lighting system developed by ITRI uses hydropower to drive the high-illumination LED light on the fire-fighting nozzles. The thermal imaging scope helps firefighters identify the fire spots or people that need to be rescued, increasing rescue efficiency substantially. Due to the impact of global climate change, bioeconomy featuring green manufacturing and renewable resources has been widely adopted. Analogous to today's petroleum refinery but replacing gasoline with biomass as raw material to produce fuel, electricity, chemicals, and foods, biorefinery has been deemed as the core of bioeconomy as it can reduce people's reliance on gasoline and decrease carbon dioxide emissions. In recent years, the Atomic Energy Council has been devoted to developing sustainable manufacturing technology based on biorefinery, converting non-food biomass such as agricultural and forestry wastes, bamboos, and grasses to low-carbon energy such as biogas and biofuel and biodegradable plastics. The technology has been adopted in industries. The Atomic Energy Council has also developed control technology for optimal scheduling and continued operation of micro grids. Through load and renewable energy forecasting as well as real-time correction, the technology can adjust distributed power generation equipment to achieve optimal operation and cost efficiency. The State Enterprise Commission has developed a concept of Circular Agriculture Park based on anaerobic co-digestion technology and a series of supportive approaches. Anaerobic fermentation can solve livestock manure and some agricultural waste by converting them into biogas, biogas slurry, and biogas residue. Biogas can be used as fuel or to produce electricity while biogas slurry and biogas residue can become organic fertilizer and improve soil fertility. For example, the anaerobic fermentation tank at the Biogas Center of the Circular Agriculture Park located in TaiwanSugar Company's Donghaifeng Farm can process 200 tons of waste per day, of which 150 tons are pig manure and 50 tons are vegetable and fruit wastes as well as biotech companies' organic waste. The biogas can produce 70000 kWh of energy every day, sufficient to power 700 households in Taiwan. In line with the theme of Sustainable Development, international exhibitors have presented their latest new farming technology including improved crops, vaccines for protecting animal health, and harvesting machines. France's SEPPIC, the world's largest provider of vaccine adjuvants for poultry, demonstrated its vaccine used in animals. Germany's Bayer showcased its vegetable seeds (corns, tomatoes, and peppers) and digital farming technology which makes farming more secure, efficient, and productive through precision agriculture. Japan's OCHIAI presented its advanced tea plucking machine. The World Vegetable Center (Asian Vegetable Research and Development Center) founded by Taiwan and six other countries along with the Asian Development Bank displayed its tomatoes with improved disease resistance, peppers with high heat tolerance, and parasitoid wasps that can fight against Spoladea recurvalis. In terms of green energy, Australia's GCCSI, Denmark's Orsted and CIP, and Germany's WPD unveiled their green energy technology. This exhibition serves as a platform for international and Taiwanese organizations to exchange technology and form cooperation on patents. Major economies have aggressively pursued the goal of sustainable development in recent years. By establishing Taiwanas a gateway for technology sharing, Taiwan Innotech Expo hopes to connect technologies to value, helping humans and industries live in harmony with nature.